In addition to recording information concerning the individuals they are designed to honor, gravestones often suggest other stories to those acquainted with local incidents. Such stories are seldom recorded, but nearly every cemetery can supply a few of them. An interesting story is brought to mind by a broken marker in an unprotected cemetery located on a farm between the site of Jordan Brothers’ Fort or blockhouse, about three miles south and one east of Thompsonville, and historic Bethel Church. This burying ground, perhaps the oldest one in Franklin County, has long been deserted, and there is no indication that a burial has been made there within a lifetime. Only one marker that memorializes a soldier who served in one of our earlier wars is left standing. Many are broken, and hogs have rooted the pieces about; some have gone into the branch that flows beside the plot. No one knew that literally hundreds of “falling stars” would appear. They understood little of the principles involved, but it was an awe-inspiring sight. The loneliness of the thinly settled Illinois country, the natural grief felt at the loss of an esteemed neighbor, and the general air of solemnity coupled with the dead helped to make the meteoric shower even more impressive in Franklin County. 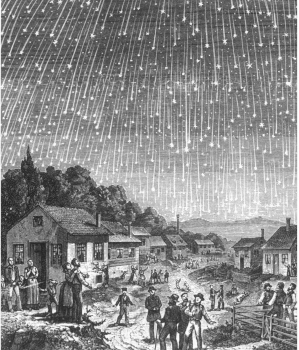 Neighbors, going to pay their respects to the deceased man or to “set up with the corpse” on that November night in 1833, were gready impressed with the fiery flashes and traces left by the speeding meteorites. “The night that Zadoc Mitchell lay a corpse” and “the night the stars fell” thus became inseparably connected. For many years after his death, one had only to mention the name of Zadoc Mitchell and the response would be, “He lay a corpse the night the stars fell.” If allusion was made to the meteoric shower, the response would be, “That was the night that Zadoc Mitchell lay a corpse.” They were much like the method used to designate time in the South in relation to the Civil War, when the expressions “befo’ de wah” and “afta’de wah” were commonly used to date events. Previous Previous post: Science of the Saints, 10-XI-2018 (28 Oct.), Holy Martyress Paraskeva of Iconium.